This classic, plain silverplate bell from Elegance Silver is a perfect gift for just about any occasion. Give the bell at Christmas time with a ribbon to be used as an ornament. Give the bell to a couple for their engagement, wedding or anniversary to celebrate their love for one another. Give the bell at graduation or other milestone to commemorate an accomplishment. The list goes on and on. There is ample room on this bell for custom engraving. 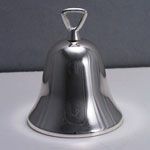 Make your gift personal by adding a name, date, monogram, achievement or other note to this silver bell. Add a bell to your shopping cart for engraving options. This silver plate bell measures 3 inches in height.